This 4-dee lineman’s belt is designed to sit like a rocking chair. The saddle type fit provides more support to your hips and thighs allowing you to sit back in the belt. With a saddle design belt, the wood pole fall restraint attached to the smaller dee rings on the bottom. This leaves the larger primary dee rings for use when climbing over obstructions with an auxiliary lanyard. This belt is constructed on leather, nylon, and features a moisture wicking mesh cushion. 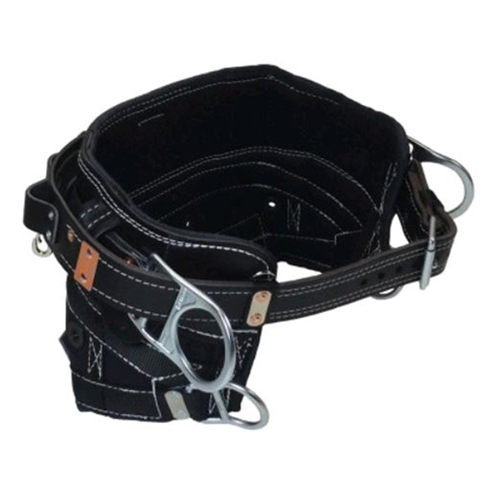 Bashlin EZ Rider Lineman’s Belt has a rating of 5 stars based on 2 reviews.